For generations, editorial cartoonists have been boiling down complicated political issues to visual gags—and perhaps more often than with any other field, have turned to sports metaphors to make their points. According to Rubenstein, Richard J. Oglesby, a canny Illinois politician and Lincoln supporter, came up with the idea of sending Lincoln's cousin, John Hanks, back to the family farm in Decatur, Illinois, to collect a couple of the wooden fence rails that he and Abe had split years before. "At a key moment of the state convention," Rubenstein says, "Hanks marches into the hall carrying two pieces of the fence rail, under which a banner is suspended that reads ‘Abe Lincoln the Rail Splitter,' and the place goes wild." 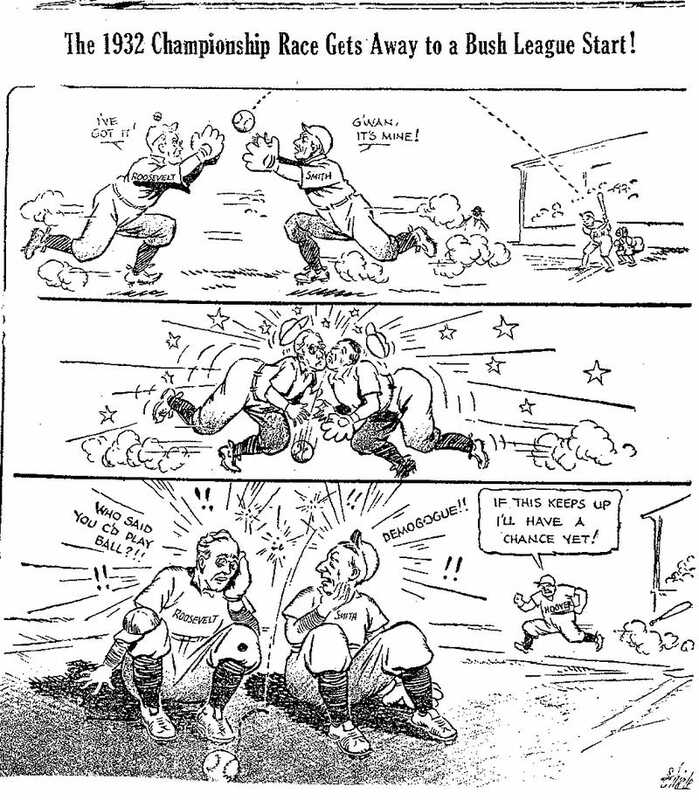 We've collected a selection of sports-related political cartoons, presented chronologically with brief explanations. Not to make any larger sociological point about American politics, but rather because we like them. 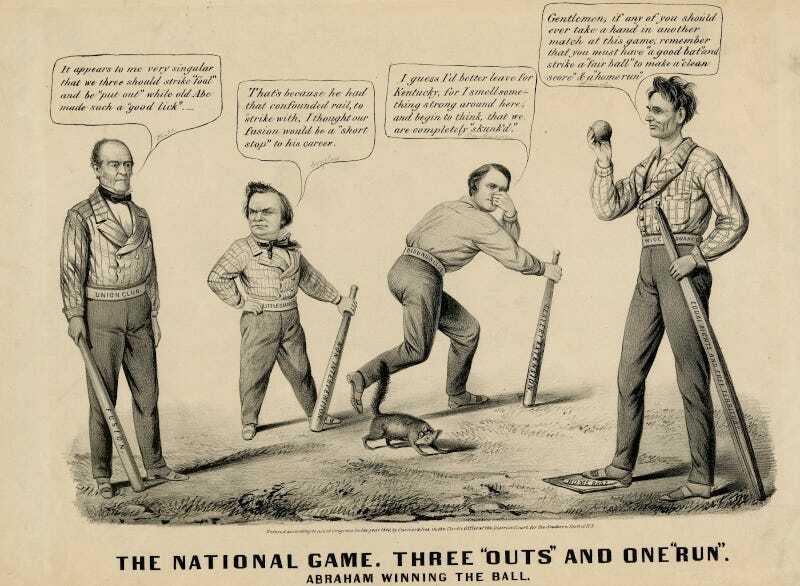 Lincoln cleans up at bagatelle (much like billiards), while surrounding political figures make sport-specific puns. George McClellan, depicted as a child on his collapsing "Chicago Platform," whines bitterly. Lincoln wins a horse race, because McClellan's horses (labeled "war democracy" and "peace democracy") are not in sync. McClellan supported the Civil War, but sharply criticized Lincoln's handling of it. In those days, states often held their elections months before the presidential election, and often tipped which way they were going to fall. Here Ulysses Grant bowls with a ball labeled "Vermont," which had gone Republican, presaging the other Northeastern states' decisions. 1884 Republican nominee James Blaine loses a footrace against his own scandal-filled record. The 1892 election pitted two former presidents against each other. Incumbent Benjamin Harrison is raring to go, while an overweight and exhausted Grover Cleveland requires his cornermen to get back on his feet. Incumbent Teddy Roosevelt waits for the 1904 Democratic Convention to select a challenger. 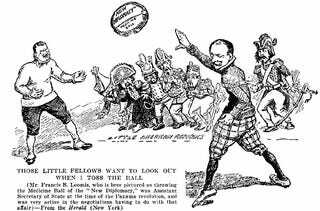 Teddy Roosevelt, our country's greatest presidential athlete, awaits the "New Diplomacy" medicine ball from the architect of the U.S.-supported Panama Revolution. Even before the 1908 Republic Convention, William Howard Taft had a majority of delegates pledged to him. Taft gets an assist from Teddy Roosevelt's support. The made basket is labeled a "goal." Roosevelt, seeking a third term, finds his bait isn't working. The delegate fish are more interest in what Taft is dangling. Warren G. Harding and James M. Cox discuss real-life sports news, Babe Ruth's then-record 38th home run in 1920, and wonder how they can hit one of their own. Calvin Coolidge golfs through while the 1924 Democratic race is bitterly contested in a bunker. Herbert Hoover reaches safely while Democrats Franklin Roosevelt and Al Smith get in each other's way. In 1937 FDR sought to pack the Supreme Court with more sympathetic justices. The old nine are relegated to a spot on the bench. With his approval ratings flagging, incumbent Harry Truman in the summer of 1948 called a special session of Congress. The GOP-controlled Congress balked, providing Truman a campaign theme and villains to blame his failings on. 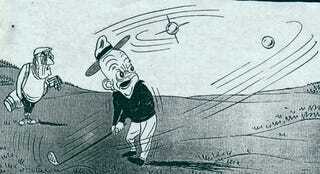 Inveterate golfer Dwight Eisenhower finally notices the Soviet-launched Sputnik. 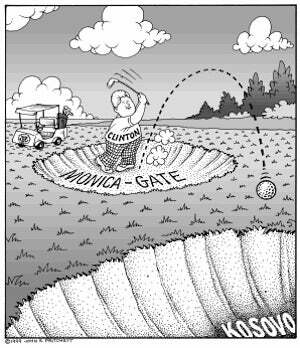 The lame duck Eisenhower continues with his golfing even as John F. Kennedy prepares to take office. 1969 saw the closest thing to an undisputed national championship college football had seen. In the last game of the regular season, No. 1 Texas and No. 2 Arkansas faced off, with Richard Nixon in attendance. Texas won, and Nixon took advantage of the spotlight to "award" the championship. Gerald Ford's ill-advised "Whip Inflation Now" campaign backfires, as the recession gets out of his control. In 1986, Ronald Reagan and the U.S. withdrew from SALT (Strategic Arms Limitation Talks) with the Soviets. This is the start of a marked shift in sports political cartoons—much less baseball, replaced with America's new sport, football. From one hazard to another for Bill Clinton. Football announcers often use war metaphors. Here, war commentary requires a football analogy. The 2008 Democratic race depicts Bill Clinton as a blocking fullback. Again, football as political metaphors—celebrating a victory with a little showmanship. Mitt Romney's Olympic experience can't get him over other hurdles.